What Is My Chemical Manufacturing Plant Worth? Takeaway: Explore what needs to happen before you sell your chemical manufacturing business and how you can get top dollar. Finding a quality, cost effective chemical manufacturer is not an easy task for businesses.You have taken pride in making your manufacturing business the best around. You have been doing this for so long that you could run the business with your eyes closed. But at the end of the day, you have started to wonder to yourself: "how much is my chemical manufacturing business worth?" A broker can help you find the answer to that question, but understanding the process is always beneficial to you as an owner. After all, your objective is to receive the maximum value for it and in order to do that, you must first look at the many variables that come into consideration when looking at the possibility of selling your chemical manufacturing business. A broker will be able to help you find the value of your business, but understanding how they get to the amount is essential to you as the owner because, in the end, receiving the maximum value for your business is your main concern. In this article, we will learn how to figure out the valuation process. You will find that there are many different approaches when it comes to finding an accurate valuation for your business. When you find the best method of valuing your business, this will give you the most accurate valuation. Below are quick definitions of the types of valuations and what they are based on. Do keep in mind that there are a variety of factors that play a part in the valuation of a business that determine what your business is worth, such as growth trends and finances. Asset Methodology – This method is based off the value of the assets that the company owns (i.e. plant and equipment). Future Earnings Methodology – This method will give you a valuation based on the estimate of monies received from an investment in the future, discounting the time value of money. Comparable Sales Methodology – This method will value based off the sale of a similar business and how closely the other business compares to yours. The average multiple that these manufacturers sell for is 4.26. What does this mean? It means the average business in this industry sell for 4.26 times net profit. 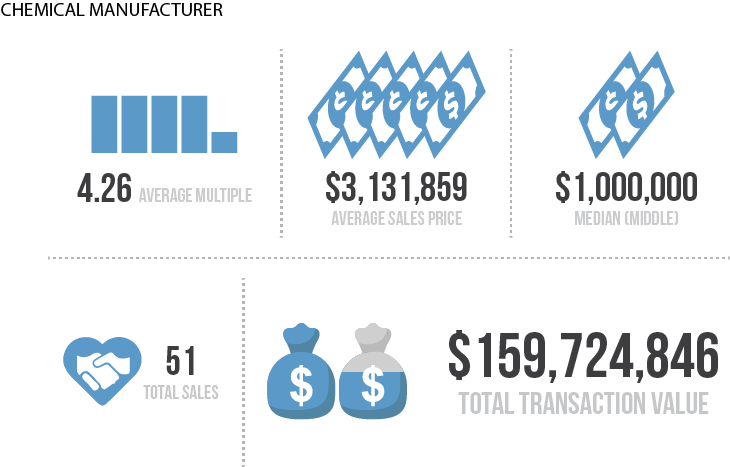 We have taken data of sales that consisted of businesses that range in the $50,000 to $10 million valuation range in the last 10 years and have broken it down for a closer look at understanding how the average multiple plays a part in the valuation process. Looking at the data collected, you can see that in 2015 the average multiple was 4.26, but to have a complete understanding, you also have to look at the other data points as well. For example, the average sale at $3,131,859 and the median sale at $1,000,000, will all be factors in your valuation. Take a look at the example to further explain the data set. Chemicals are an essential component of manufacturing and are vital to industries such as construction, motor vehicles, paper, electronics, transportation, and agriculture. Although some chemical manufacturers produce and sell consumer products such as soap, bleach, and cosmetics, most chemical products are used as intermediate products for other goods. For example, let's say a chemical manufacturer is successfully making around $250,000 per month. Below, you can find the data that is an estimate of their sales and profit projections based on the data collected and analyzed. As stated earlier, you can see that the larger your business, the higher the amount of money you can ask for when ready to sell. Keep in mind that there are always fluctuations in the market and that different variables will give you different values of a business. So, comparing your business directly to a firm next door will not get you the answer you seek; but, generally, the bigger your business, the more money you can ask for. This graph below represents the total deals that were sold at each valuation range. For example, in 2014 (light blue line), there were three deals sold between $500,000 and $1 million. The data below breaks down the analysis we have conducted on 51 business sales in the last 10 years and, as you can see, as your revenue increases, the higher your multiple becomes. What does a higher multiple get you? A better return on your investment. The next graph represents the valuation multiple for deals completed at each valuation range. For example, in 2014 (light blue line), deals sold between $2 million and $10 million received an average multiple of 7.07X yearly net profit. So, if your business sold for $5 million, it was likely making $707,214 per year in net profit ($5 millions divided by 7.07). What If I Want to Sell My Business? When it comes to the valuation of your company, there are many factors that can increase or decrease the value. Potential buyers will examine things such as sales and profits as well as the length of the time your business has been around; however, those are not the only factors that increase a valuation, because they do not tell the entire story of your business. What are the growth trends? What is driving new sales and is it sustainable? What channels do new customers come from and what is the breakdown of each channel? What is your market position? How reliant is the center on the owner? What systems and processes are in place to run the center? Deciding to sell your business is not an easy decision for most. It can become overwhelming at times and it may be for a different reason than for other business owners. But whatever your reason, be sure that you possess the necessary tools and understanding of the correct value of your company. To help you as a confident business owner, we have implemented a tried and true, step-by-step process to give you the best valuation for your business. Many essential steps are forgotten or overlooked by some business owners in the selling process, but by completing all the steps we've put forth, you are sure to receive the maximum profit for the sale of your business. the brokerage has grown with total sales expected in 2016 of $20,000,000. When is the Best Time to Sell My Business? Who Will Buy My Company? How Will You Find the Best Advisor to Sell Your Business?